Hill walkers have been outraged by a proposed 800% increase in parking charges at one of Scotland�s most popular mountains. Argyll & Bute Council has announced its intention to increase car parking charges in Arrochar, at the head of Loch Long. The proposed increase will take the hourly charge from 30 pence to �1 and the rate for the full day from �1 to �9. The increase is due to come into effect from 27th August 2018. The car cark at Succoth is well used by walkers heading for the distinctive rocky peak of The Cobbler, as well as Beinn Ime and other of the Arrochar Alps. Davie Black, Access & Conservation Officer with Mountaineering Scotland, said: �We appreciate the financial pressures that local authorities are under and that the provision of car parking facilities incurs a cost. �Our members are used to seeing daily charges of �3-4 for parking in popular walking locations, such as at Glen Nevis and at Forest Enterprise sites. We regard this as a reasonable cost to ensure that cars are safely parked off the road while walkers enjoy their time in the hills. �However high car parking charges can create a barrier to those wishing to exercise their right of access to the countryside, particularly those with lower incomes. And this is all happening at a time when Scottish Government policies are firmly committed to social inclusion and promotion of outdoor recreation for the health and social well-being benefits that it brings to people. �The huge increase from �1 to �9 that Argyll and Bute Council intends to impose targets people who have no other option to safely park a car. The provision of free or reasonably-priced car parking plays an important part in encouraging responsible parking and helping to prevent cars being left in places that could result in risks to other road-users. There also needs to be clarity on the situation for overnight parking, as many people will want to leave their cars as they camp up in the hills. Stuart Younie, Chief Executive Officer of Mountaineering Scotland, said: �Survey results indicate that many of our members are in favour of modest charges where money taken in is going to be invested in the infrastructure. There is no doubt that local councils are under ever-increasing financial pressures, however, this charge appears to be treated as a way to help balance the budget rather than to promote and support tourism and recreation, which are key economic drivers for the area. Walkers who wish to voice their opposition to this 800% increase in parking charges at Arrochar are encouraged to contact Mr Cleland Sneddon, CEO of Argyll & Bute Council. The Leader of the Council is Ms Aileen Morton. The Constituency MSP for the area is Ms Jackie Baillie. 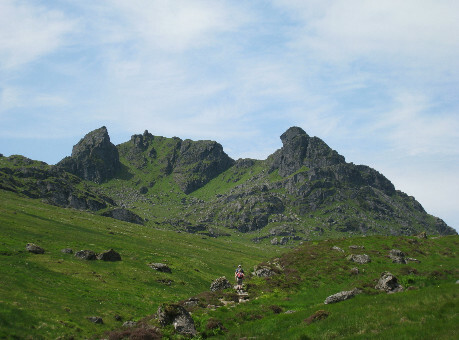 The Cobbler: visits to the iconic mountain could become pricier in future.